“Reading with the Egret” contemporary figurative painting. acrylic on canvas. 36 in x 30 in. The Egret reads books to me on the River. The moon is rising full so I can see the words too. 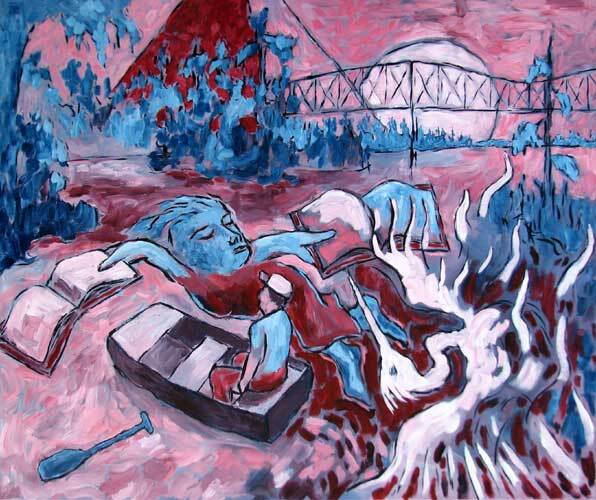 In the dream, we are floating the River just above Memphis in the here and now, but it also not the present day, all at the same time in the way it can be both in dreams. I remember trying to hear cars on the bridge or the sound of Memphis, but it was dead still, not even bullfrogs, like in winter. I work from the imagination. It usually takes me several hours of staring at a canvas before I get a rhythm going. Once the rhythm is going, I feel connected to the painting in that I know where it is going and intuitively how to finish it. This can be very problematic. Once I get in this state of mind, I am reluctant to leave the canvas until it is done. I will stay up all night if necessary. I will work exhausted, anything but leave the painting unfinished. Toward the end of the session (that can be 10 or 12 hours long) I am making bad decisions, and this has meant a lot of flawed art. But now I think things are changing. I am learning how to work on paintings over time instead of all at once in one studio session. This painting is a first in that I could work on the canvas over days without losing my sense of color layers, and I could continue where I left off previously. I am also learning how to use low-intensity dilutions in compliment (over a prime of “gray” made from their mixture) to render compositions with some sense of lighting when I don’t have any model. I think this painting is also a successful first in that regard as well.